This design is made in 4ply yarn - ideal for using up those scraps of 4ply in your stash. 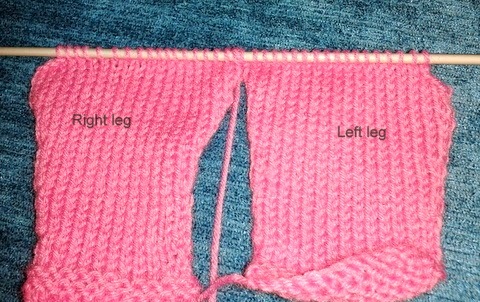 The legs of the pants are knit separately and then joined to knit the body with a centre back seam. The cropped top is worked in one piece to armhole shaping with a centre back seam and one button fastening. I've also added a cute headband! The pants have side leg seams and centre back seam. The 3 cast off sts should be on either side of the row. Cast off loosely in rib. Cast of loosely knit wise, when casting off work k2tog at either side of 9 cast on sts to shape neckline. Sew back seam to cast on sts of back edging, slst border flap in place. Sew on small button to correspond with buttonhole. Great pattern, I turned the top around and used a gold button to fasten, looks good both ways. Thanks for the pattern.